Really sorry I've been away for so long. Lot's of things have happened, but to keep things short: I resigned from my old job 2 months ago, went away to Europe for 3 weeks and start my new job on Monday! 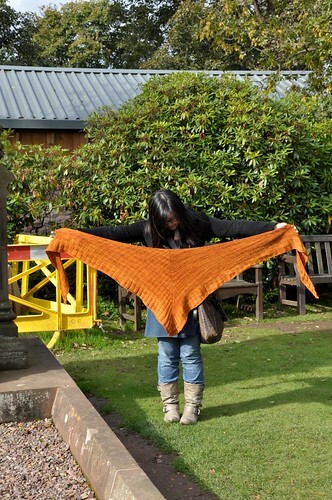 And so, I return to this forgotten blog with a completed FO! I present The Mistaken Pumpkin. 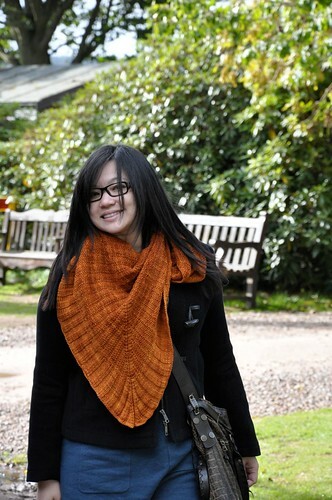 Inspired by our first trip to Scotland (and by the fact that we were going to be there in autumn), I decided to make use of the Pumpkin Latte yarn I purchased from the Plucky Knitter in 2008 and found an extremely easy to understand and really pretty pattern: The Mistaken Shawl. Completed in early August, I washed and blocked it immediately and eagerly waited to take pictures of it "on location". The perfect opportunity presented itself when we visited Roslyn Chapel, just half an hour away from Edinburgh city centre. The weather was sunny for long enough for us to take these pictures, before it started raining again. I used 2 skeins of Pumpkin Latte and 4.5mm needles. The weather has gone bad since then, it's starting to freeze at night here in Belgium. Hope you're well and good luck with your new job. A twenty-something KL born-n-bred girl who is addicted to knitting and is always thinking about her next meal. The story behind it all..
My biggest craft inspiration: My mom, Lucy and grandma, Ruby. Mom has always been interested in handicraft. Ever since I can remember, she is always busy with some sort of "project".. be it the festive hampers she creates for her clients, little hand-made cards she designs for church events or even little crafts ideas she come up with for the kids in her church group. When I was a toddler, I was more often than not, dressed in an outfit crocheted by my mom. My late maternal grandmother was also good with her fingers and taught me to sew and cross stitch. I remember my lessons with her making hair scrunchies and little rosettes to embellish my dresses with. I must admit I did not learn knitting from either of them but instead from a very good friend. We were 3 bored girls in London who somehow decided to start knitting. Unfortunately, I seem to be the only one who has continued on. My biggest food inspiration: My dad, John and boyfriend, Rommel. Okay perhaps my dad plays a bigger part since he has been there to feed me since I was born. But of late Rommel and I are the "guinea pigs".. going out to try new restaurants and coming home with comments to my dad. I mustn't forget my sister, Priscilla and brother, Patrick. Priscilla (we call her by her Chinese name Shen) is my partner in crime when it comes to baking nowadays. She recently moved back to Malaysia after 5 years in England but pines for her life in England. She blogs at Kimono Daisuki. My brother Patrick (also known as Fatteh because he was once a really fat kid) suddenly decided he wanted to become a doctor and got himself into Cambridge to study medicine. This blog is pretty much our way of communicating with him. What better way to torment a sibling suffering through miserable English weather than with pictures of glorious food and sunny holidays.